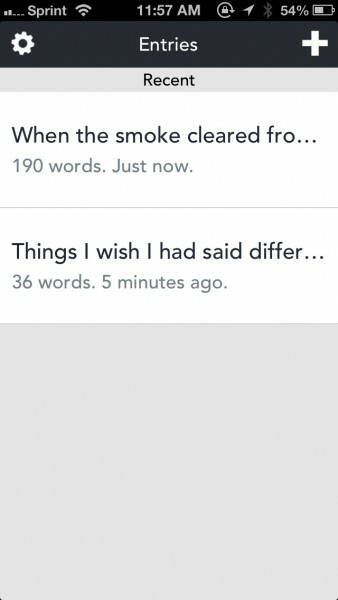 Prompts ($3.99) by Tanner Christensen is an app that focuses on distraction-free writing and also wants to help prevent writer’s block. 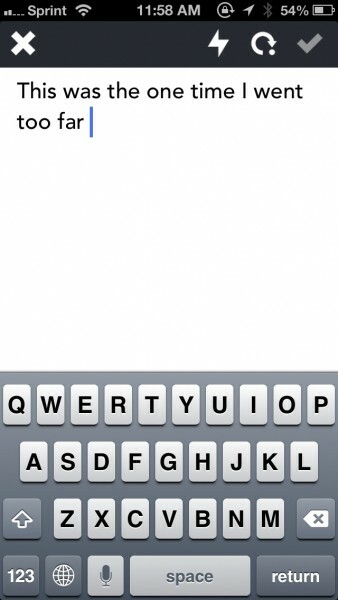 If you struggle with writing at times, then this app is definitely one to consider. I love writing — after all, that’s why I’m here! It’s definitely one of my passions, and I wouldn’t trade it for anything. If there’s one thing I can’t get enough of, it’s definitely writing apps. However, I know that it can be hard to write at times, since writer’s block always seems to strike at the worst times. Fortunately, there’s an app for that. I was drawn in to Prompts because it sports a minimalistic interface, which is always something you want in a writing app, unless it’s a powerhouse like Editorial. The interface is lovely, as it sports a flat look that will blend with iOS 7 quite nicely, and there are no distracting chrome elements to it. 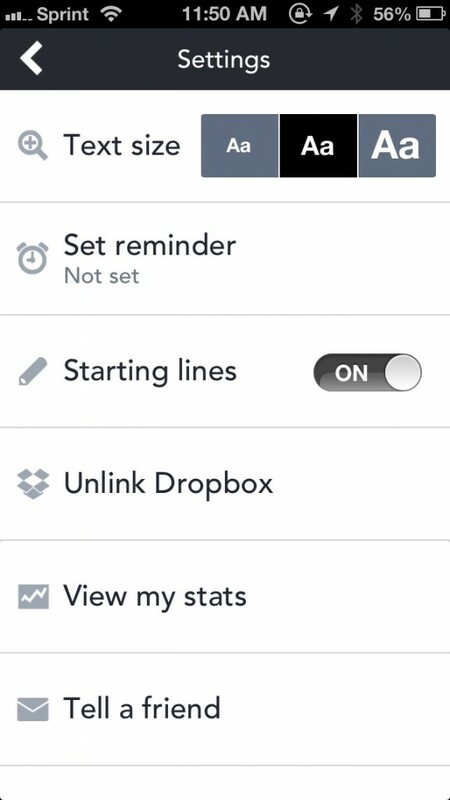 With Prompts, there is no extra fluff, as the app only features just what you need — nothing more and nothing less. 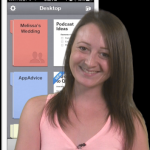 No tutorial awaits you with this app, as it’s all fairly self-explanatory and intuitive. 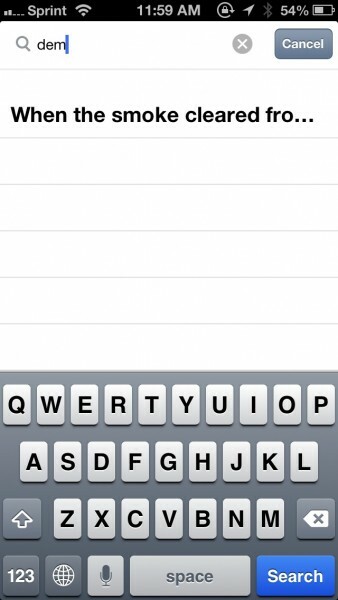 The first thing you will find when you launch the app is a blank screen, ready for you to type. At the top of the writing screen will be a toolbar, with several options: Cancel (X), Quick Prompt (lightning), First Sentence Prompt (clockwise), and Done (checkmark). Whenever you start a new entry, the app will have a prompt written out for you, and it’s your job to go with it and finish writing the thought. 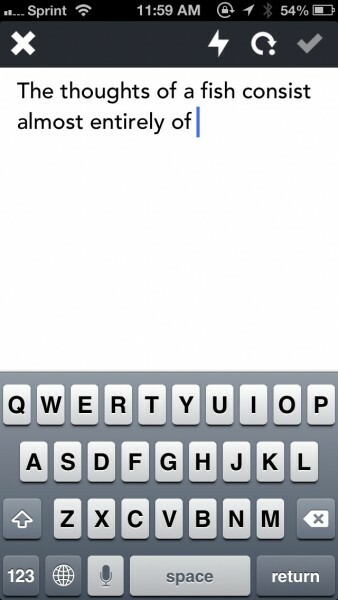 If you don’t like the prompt, you can get a new one by tapping on the button with the clockwise arrow icon. 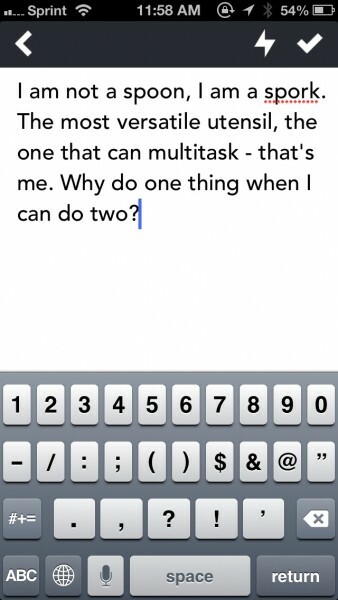 Once you start typing, Prompts will go into full screen mode, eliminating all distractions so you can focus on writing. You can recall the menubar by pulling the screen down. However, even when you are in full screen mode, you can do the Quick Prompt option, which will display helpful ideas in a small popup box that disappear after a few seconds. These will say things like “incorporate your mood” or “go against the grain,” in case you were unsure of how to approach the actual prompt. In each prompt, you can write as little or as much as you want, with no time limit. When you’re done, just tap on the checkmark to save your entry in the list on the main screen. From here, writers can see how many words were written for each individual entry, and how long ago it was modified. You can read each one and even add more to it, as well as use the quick prompt tool if need be. Entries can also be bookmarked to display a visual indicator in the list, so you can spot your favorites at-a-glance. While it may seem like your writing is trapped in Prompts, it’s actually not. 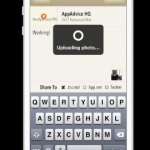 As you view each entry, you can actually share your entire draft with the Share menu. This brings up the option to copy the text, email it, or send it to third party apps including Evernote and Day One, or even share it on Twitter or Facebook. Once you start accumulating entries, it becomes harder to find stuff you want to recall, despite the bookmarking feature. Fortunately, Prompts has a search function, which can search for keywords through entire entries, not just the prompt itself. Results for your inquiry are delivered in real-time. 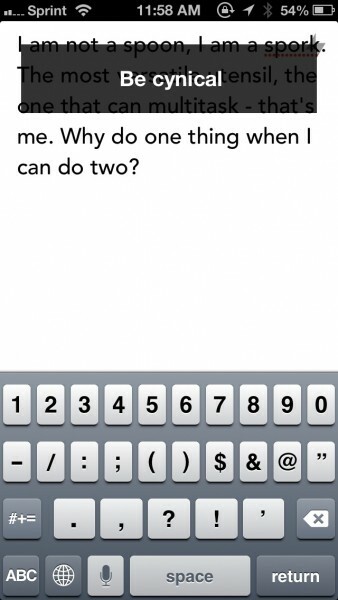 Prompts is a rather simple little app, but it also has some customization options to get the best experience. Settings can be accessed from the entry list by tapping on the gear button in the top left corner. 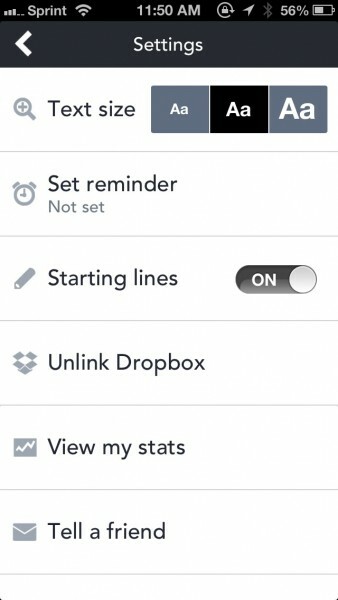 From here, you can change the text size (small, medium, and large), set up a daily reminder so you always get some writing done, toggle starting lines by default, set up Dropbox syncing, and even view stats. I found the stats to be the most interesting part of the app, because it will show you a graph of when you did your writing, tell you the most active day, total writing time, and average amount of words per prompt. For whatever reason, the app can be reset, causing your current entries to be deleted and Dropbox unlinked, and you get a new slate to start on. I’m really enjoying Prompts so far, as it’s a great app to help you exercise your writing. 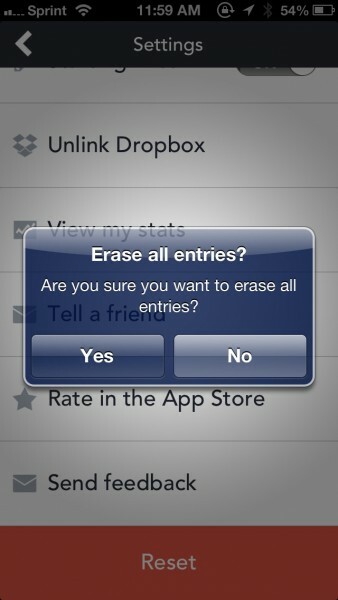 The uncomplicated interface makes it a delight to use, and the prompts can really help get your writing going. It’s the perfect solution to practice and develop your writing, preventing that annoying writer’s block. I would like to see more typefaces added to the app, though, since you can change the size of the text, why not the font used? While I like Avenir, some may not, so it would be nice to have the option to change it. 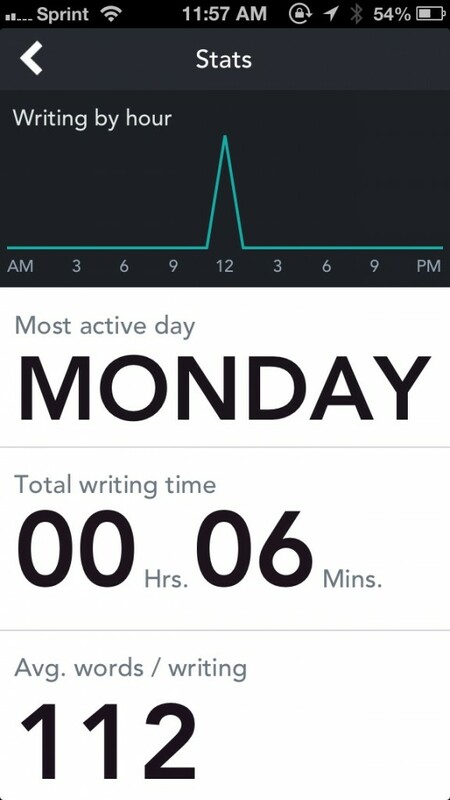 Still, I recommend checking out Prompts if you need an app to help overcome writer’s block, or just want to get motivated to write more every day. 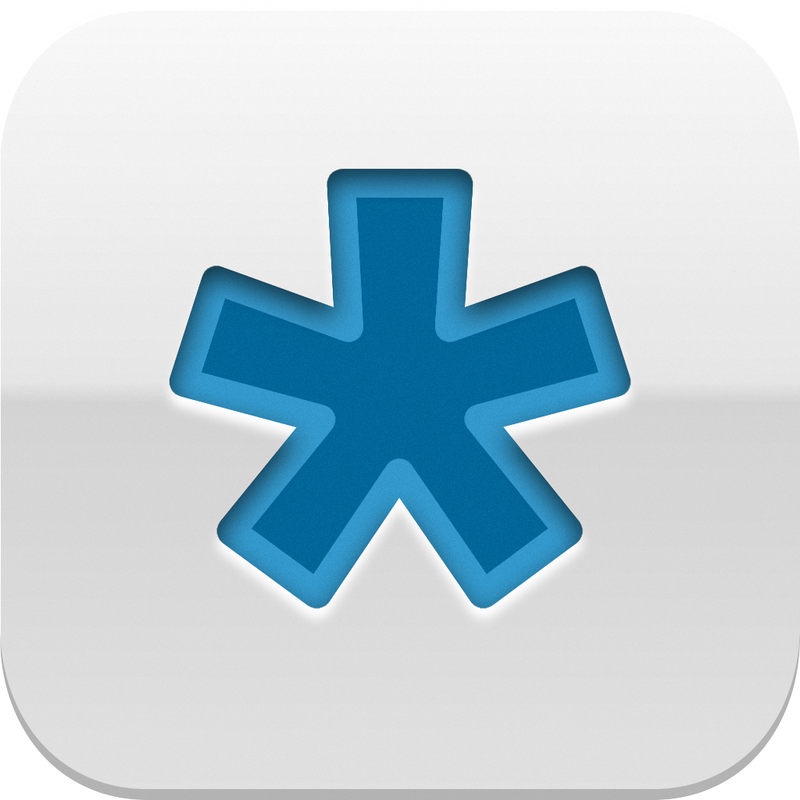 The price is a bit on the higher end for an app this simple, but it does the job very well. 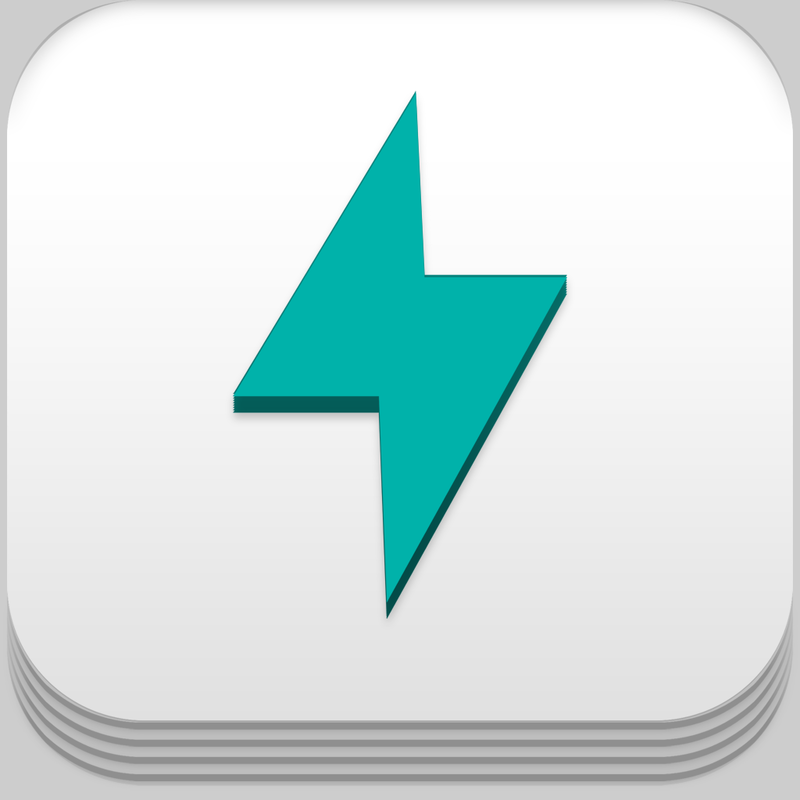 You can find Prompts in the App Store as a universal download for $3.99.